Picture ten times the people you see in this picture and you will have what the malls will be like any time in December. People will be running mad in all directions trying to find the elusive present in a time limited shopping spree. Children will be whining and babies will be screaming as you try to squeeze by their strollers! Ah, the seasonal joys of Christmas Rush! Now, picture a craft sale at the local church. Even if there is a short line-up to get in, you enjoy talking to all the people you know and probably see yearly at this same event. There's Thelma, bringing in her famous apple pies. Louise will have her delicate and popular tree ornaments at her table alongwith her husband's stained glass angels. The church ladies have a well stocked table of home made jams, salsas and pickles. There is a fabulous selection of knitted hats, scarves and gloves. Everyone flocks to the rummage table where the good old barter system is still in effect! Just make an offer to the old retired pharmamsist who always presides over this table. The baking table is superb and I hear the $5.00 lunch tickets are going quickly because Bea has once again, made her cabbage rolls! With a salad, sandwich plate and a piece of pie, you can relax and chat with friends while watching the flurry of activity. You just can't beat this small town phenomena. It is part of our heritage. And I, for one, would much rather spend my time and money supporting this local annual event, than put myself in that crazy crowded mall after driving around for ten minutes trying to find a parking space! Mother of Invention, checking names off my list after the craft shows! You've got the right idea. 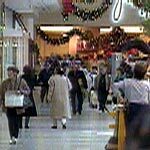 Avoid the malls until well into January when everyone else is too cold and too broke to be there. Malls in December typify the worst of the Christmas spirit. Local church craft sales are the best and are usually jammed too! How true, MOI. To aviod the rush altogether I've been sitting at my kitchen table with paper and glue pot and drawing pens, making gifts for everyone on my list. I haven't been to a mall in years! I accidently went near a mall yesterday. What a mess. I am going to mail order anything that i want to buy, or get it at a craft fair like you have described. Wouldn't it be lovely if the Christmas spirit meant homemade gifts? After going into our local town this morning to fetch my runaway dogs, I realise you are totally right! Just to drive into the town took long enough, and I didn't go anywhere near the shops!! Barbara:AND when the 50% off sales start! Old Lady:Yes, I've been to a zillion and you have to line up outside the cgurch early! But I've got some really neat things there. Pauline: Excellent! You must be crafty! I'm afraid I'm not so much that way. Meno:I bought a lot online one year at World Wildlife and others like it. Nice things. I'd be baking things for people if all gifts had to be home made...I'm not crafty much. Annelisa: I sure hate the traffic and trying to find a non-existent parking space! Good idea to support your daughter's school and get gifts done too. You've got the right idea! The food descriptions are making me drool. I so much agree with you and are so glad we actually don't have that many malls in Norway - I'm more into this local markets too. I detest malls in December. Actually I detest malls most all of the time. 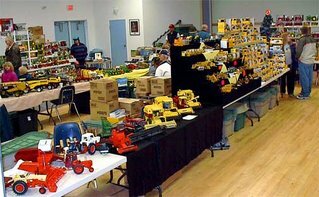 I would much prefer a craft fair where there are unique items, smaller crowds and friendly faces to talk to. Bobealia: I used to make them but don't anymore! They're the best! Especially freezer jam. Diana: Yeah, those ladies make everything...even meat pies! Renny: Must be nice not to have Mall Mania! Your culture has beautiful crafts. Maggie: I go to tons of them, big or small! The craft show sounds lovely! Much better than the crass commercialism of the local malls during the holiday season. Thelma and Louise? Did you make that up? Or is there an actual pair of people named that at the show? Brooksba: I am so NOT looking forward to the few trips I do have to make to the mall! I made up Thelma and Louise, although there could just as well really be ladies by those names that I just don't know. I am not too fond of malls. I try to get gifts other ways. I purchased a few online. I was really happy with them too. Today I went to Bowrings and got some beautiful crystal candlesticks for Amber. They also made up a beautiful charger plate with pillar candles on it! I could have purchased the whole store for her! Lynn: You are lucky to be such a crafty person! And you don't have too far to drive to a mall! I love Bowrings! It is so classy. I don't know what a charger plate is!?? Hope you have most of your gifts finished.